What a delightful story about inclusiveness and community. Unique way to approach diversity through color blending! Reminds me of International Dot Day and would pair well with The Dot and another book, Line and Dot. Always enjoy your perspective as a writer and an educator. What an interesting thought, Patricia. Thanks for mentioning those related books! I adore this story. And agree, what a fresh take on an issue kids may hear is important but don't have enough experience to maybe understand why. It's so great, isn't it? Thanks for commenting, Keila! 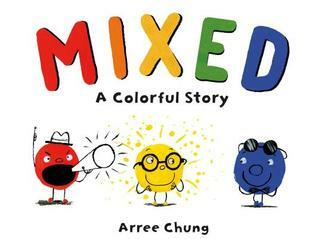 I think this is one of my favorite books of the summer and definitely my favorite of Arree's so far. I love this book. It is one of those that strikes me as "really, somebody hasn't done this already!" It is genius. Great review & I love your activities. You're right, Maria. Genius is a good word for it! Thank you for stopping by. I totally love this story! Excellent review! I keep hearing how much everyone likes this - high time I read it! I think you'll enjoy it. I always enjoy colour on black and white lines as a design. Always pops! Sounds like a definite keeper. I'm pinning so I don't forget about it. Thanks! I'm going to buy my own copy for my class. Definitely a keeper! This is such a fun way to look at secondary colors! Great activity. Gotta read this one again.